While fall colors are emerging on the Taneycomo lakefront, the generation pattern has stayed the same. The only variance has been how much water has been kicked on about 3 p.m. every day. That amount is somewhere between 65 and 150 megawatts or from just over one unit up to three full units. Then the water has been back off by dark or 7 p.m.
That afternoon boost of water has really messed up fishing. The current breaks loose gobs of pondweed growing along the banks and sends it down lake. It also picks up the algae off the bottom of the lake and clouds the water, catching on just about anything you drop in the water that's attached to a line, like a hook or lure. If you know it's coming, you can boat down lake and get ahead of it for a while. Our guides will run down to the Branson Landing area and fish for an hour or two, then boat back up to either Fall Creek or the dam and fish. By this time, most of the junk has washed down out of those areas and it's safe to fish. Big fish are starting to show up on Facebook and Instagram -- both rainbows and browns. Yes there are a good number of brown trout in the first mile of the lake below the dam, but rainbows are also starting to color up for their winter spawning run. Chuck Gries, owner and operator of Angler's Outfitters, has been guiding fly fishers below the dam for many years. He takes people out in his boat as well as wading in below the dam. So far his clients have landed a couple of big browns. He said the hot fly is his light brown chammy worm. Another nice brown caught by a client of Chuck Gries. Bill Beck was guiding a man from Springfield, Missouri, yesterday out of his boat, and he caught this very nice rainbow. 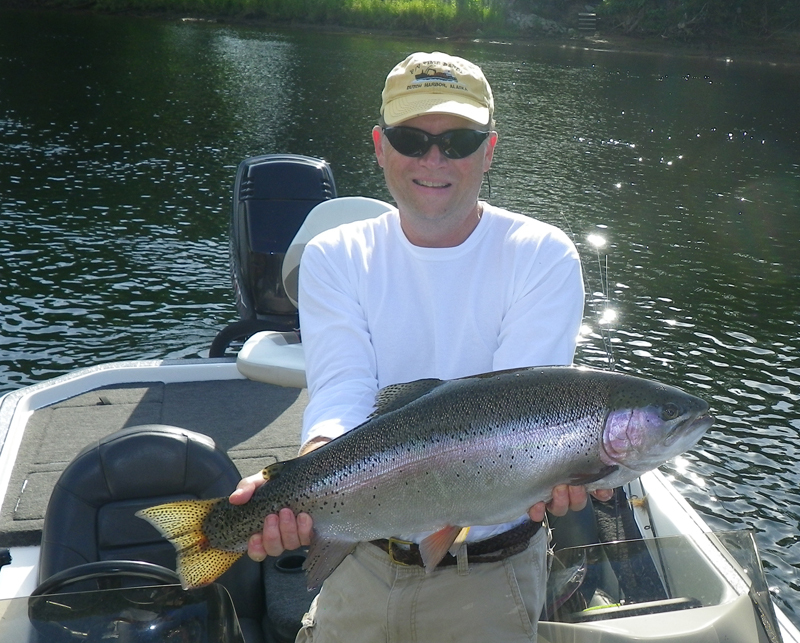 All big trout are released by our fishing guides. David Doty has been fly fishing at night for trout below the dam, wading in off the shore. Here's a 25-inch brown he caught and released last night. Our water temperature has been hovering around 62 degrees now for over a month. I am glad to see it not go on up into the mid to upper 60's as I thought it might. The D.O. (dissolved oxygen) levels haven't been too bad. Constant generation has helped that. I've been getting out and throwing a jig the last few days. A couple of weeks ago, I found jig fishing slow, but I'm glad to report it has picked up. Ginger seems to be the hot color, either throwing a straight ginger or another color mixed in (sculpin or brown). I also did well throwing white, as did other anglers this past week. I've been throwing a 3/32nd-ounce jig with this light generation flow, two-pound Vanish line which seems to be the best weight. I can get the jig to the bottom pretty well and work it slowly -- that's what the trout have seemed to like. Our trout are still taking scuds and midges, too. Early morning and late evening is best for midge hatches and fishing Zebra Midges under an indicator. But with the U.S. Corps of Army Engineers running more water in the evenings, it's best to fish early in the morning. The inside bend below Fall Creek is a great place to start, dropping a #14 black, rusty or red Zebra under an indicator 18 to 24 inches. Cast to surfacing fish or just make long drifts on that inside bank. From Lookout down, fish a scud/San Juan combination under an indicator six- to nine-feet deep, depending on where you're drifting. In the channel, fish deeper and on the shallow flat, fish shallower. Hot pink San Juan has been good and so has Chuck's tan shammy worm. Dry flies are still hot! 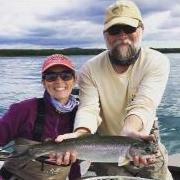 Took Marsha out the other evening and she did well, especially since she only fly fishes a couple times a year. She needs to get out more! Stimulators and hoppers worked close to the banks (not on the banks) from the dam down to Fall Creek is the area -- middle of the day is best, but morning and evenings are also pretty good depending again on generation. Below Fall Creek, drifting using bait has been spotty, but what I'm hearing is that most people are catching trout well in the mornings but only fair in the afternoons. Drifting with night crawlers is still best, but I think where most anglers make their mistake is with the amount of weight they're using. With the generation pattern we've seen now for a couple of months, even the smallest drift rig bell weight we sell, that weight is too heavy! I've been showing people how to tie a simple loop knot in the place of that bell weight and pinching on a small split shot instead. Slide the split to the knot--the knot will keep the shot from sliding all the way off the line. And if you get it snagged on something, chances are it will pull off and save the rest of your rig. Plus, the split shots are easy to switch out if the weight is too big or too small. You only want enough to get your bait to the bottom--that's all. If it's catching every two feet, you're using too much weight. This will make your bait look more natural flowing with the current, plus you'll feel the bite so much better! Pink/white Gulp eggs are also hot colors. Some of the guides are using our Trout Magnet jig heads and putting one Gulp Egg (sunrise color) on a hook and fishing it under an indicator five- to seven-feet deep from Cooper Creek down to the Landing.